Fine Art Shippers is mainly focused on packing and shipping fine art of any kind. However, we actually offer much more art-related services, including fine art storage, art advisory, and art installation. 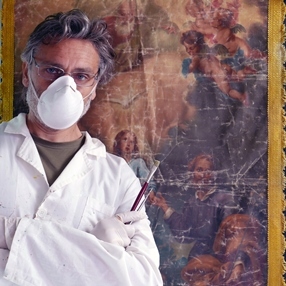 Moreover, we can assist with high-quality art restoration services. Thus, if you need cost-effective temporary or long-term fine art storage solutions, need to stabilize and salvage your artwork, or simply want to ensure that you are purchasing the right piece, Fine Art Shippers is always at your disposal! Besides, we can also help you choose the best conservation center for your treasured art. For example, Fine Art Conservation Group located at 529 West 20th Street, NYC is one of the best places to come for help, and we want to tell you more about it. Established in 2000 by professional paintings conservators Helen Im and Suyeon Kim, Fine Art Conservation Group is now one of the most trusted conservation studios specializing in contemporary and modern paintings, works on paper, and mixed media objects. Moreover, its fully equipped facility in Chelsea’s gallery district can safely accommodate both small and large art pieces, so if you have an oversized artwork, Fine Art Conservation Group is still the right choice to come for professional help. Plus, studio’s conservators also work with murals and public art. Whatever art advisory, art restoration, art conservation, art installation, or fine art storage services you need, please feel free to contact Fine Art Shippers! We will be happy to help!